The order was received the next day which was fantastic and so efficient - will definitely use you again and recommend you to my friends and family. As some parts are not always as they seem it refreshing to get just what I asked for with no fuss or trouble. So far , so good. Excellent service and delivery. A Really good product a Good replacement for the original cutters and foils and Great seller. Very quick delivery and Well wrapped. Many thanks yet again ! Competitively priced and excellent service. Item was delivered the following day. Item arrived in the post the following morning and was exactly what was required. Saved hunting around the shops for parts. Excellent site makes sure you order the correct pack for your razor. Fast delivery and good instructions in the razor book allow easy replacement. Will buy from here again. the shaver head - foils and cutters - arrived promptly; it was easy to install and works very well. Thank you. excellent really sharp and they have made my shaver new again! Replacement Remington SP96 MS5 Titanium series foil and cutters were as described and arrived the next day. Shaver was back in business within a few minutes. I am very happy with my purchase. MY ORDER WAS BASICALLY WITH ME WITHIN 2 DAYS. EXCELLENT SERVICE, THIS SPARES PRODUCT WAS NOT AVAILABLE IN THE SHOPS ANYWHERE SO IT WAS A" GOD SEND" TO GET IT FROM THIS COMPANY.THIS IS THE SECOND TIME I'VE USED THE SERVICE. Replacement cutters and foils arrived within 5 days, fitted within 10 minutes and job done. All good, with no fuss sales and service delivery. Thanks. This was the only site that said Remington MS 5700 / MS 5500 was the same as MS 5120. It fits the shaver and works great. Excellent service will us this company again. 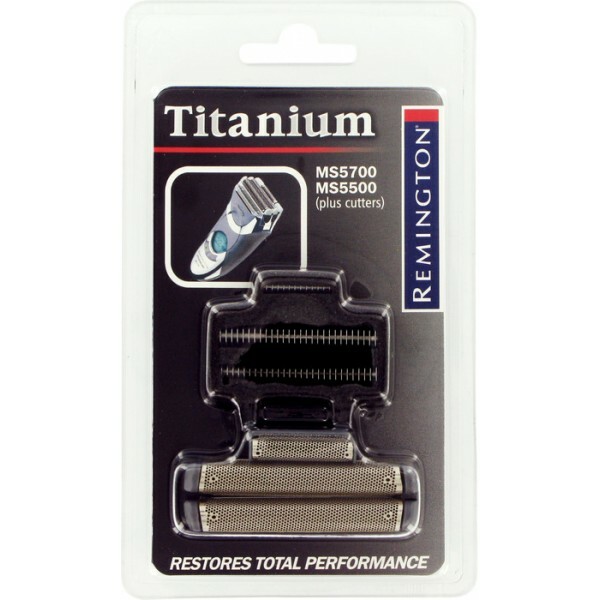 The Titanium Series by Remington is an excellent razor having just changed from Braun i am more than satisified and the replacement foil and blades are excellent. I could not find the part i wanted to match exactly what i wanted so i did a contact us, this was Saturday night about 8pm i immediately got an answer which enabled me to place my order and by Tuesday i received it. excellent service i will use it again. Spares as ordered and arrived promptly exactly as specified.